A handmade Egyptian KM Hookah, the Khalil Mamoon Kuwait Tower is a 36 inch tall, single hose work of art. A durable, heavy metal stem and glass vase make this Khalil Mamoon Hookah easy to set up and maintain. Variation Warning All KM Hookahs Are Unique And The Stem, Vase, And Hose Patterns And Colors May Vary From The Color Selections and Photograph Listed Above. 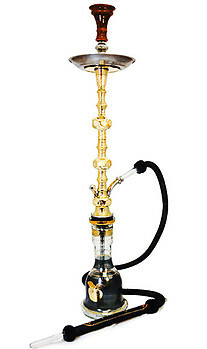 Also, this KM Hookah model may come as a two door model as well as a one door model, having two or one decoration balls which may also vary from the photograph and effect the overall height of the Hookah model. Click Here To Contact Customer Support If Further Clarification Is Necessary Prior To Ordering This KM Hookah model.